Another year, another birthday for the Portugal superstar, but how do Los Blancos perform when their biggest name is not on the pitch? There is no doubting that Cristiano Ronaldo is one of the most entertaining footballers of all time. With him in the side, Real Madrid score on average half a goal more than they do without him. On Sunday, Ronaldo celebrated his 32nd birthday after a magnificent year in which he lifted the Champions League and European Championship trophies. The Real Madrid superstar showed no signs of slowing down as he had a fantastic 12 months in 2016, picking up another Ballon d'Or as well as being crowned the Goal 50 winner. However, with each passing year and every birthday, the Portuguese legend is getting closer to retirement, with his time at Real Madrid shortening further. He has been at Santiago Bernabeu since signing from Manchester United in 2009, scoring more goals than matches played for the Spanish giants with 384 goals from 373 appearances in all competitions. But are Madrid that much worse when Ronaldo does not play? Sure, they may only score 2.4 goals a game compared to 2.9, but are they doomed once Ronaldo retires? The stats indicate that Ronaldo's presence in their line-up actually makes little difference except for in the goals scored column. The two-time Champions League winner's goals scored column is greatly helped by the fact that he has 40 hat-tricks and ended up with two goals in 62 other games. In fact, in La Liga, Real Madrid's win percentage is higher when Ronaldo is out of the team (76.1% with Ronaldo, 76.5% without). They score more when he plays, but average the same amount of points (2.4 points per game) in both circumstances. When he plays, Ronaldo makes Madrid win more comfortably, but they do not need him to win. In all competitions, the win percentage sways the other way, but is similarly close - 72.9% with and 72.4% without. Ronaldo is a great entertainer for Real Madrid, but they can cope without him. He is another year older and another year closer to retirement. But based on the stats, Real can survive without him. 0 Response to "DO REAL REALLY NEED RONALDO? 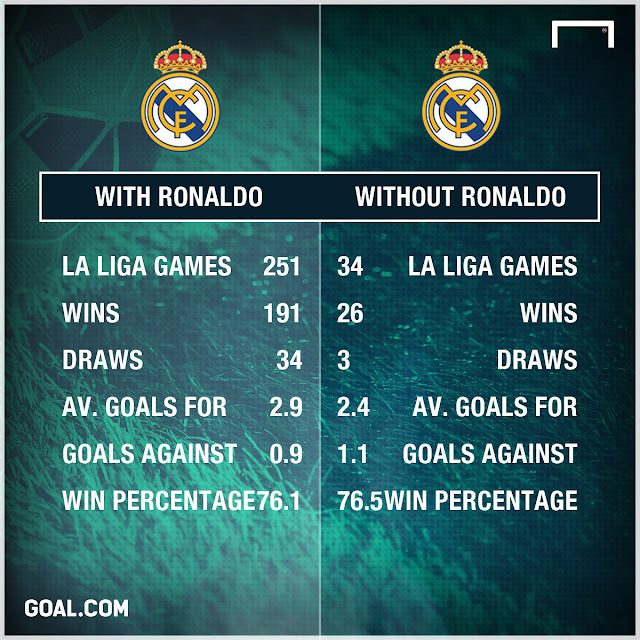 - MADRID'S STATS WITH AND WITHOUT CRISTIANO"